Chinese structures are just 81 metres away from the Indian post in Doka La in Sikkim. China justifies its construction activities in Doklam as "legitimate"
China today justified its construction activities in Doklam as "legitimate" and said that India has no business to comment on what it does on its territory. Satellite images revealed a full-fledged Chinese military complex being built within Doklam, but India maintained that status quo has not been altered in Doklam, where Indian and Chinese troops were locked in a stand-off for over two months last year. "Our attention has been drawn to some reports that question the accuracy of the position stated by the government in respect to the situation in Doklam," Ministry of External Affairs spokesperson Raveesh Kumar said. 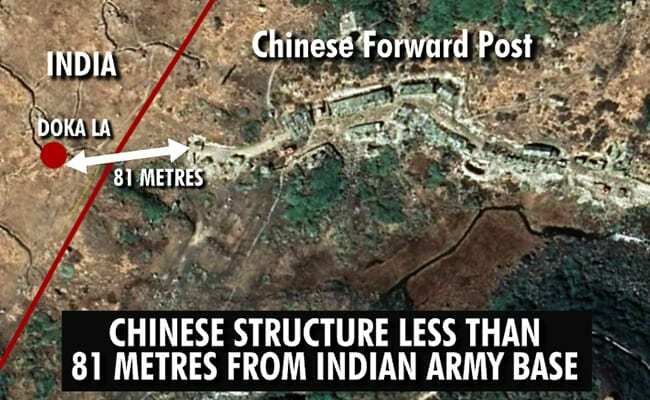 Almost five months after India and China ended a 70-day standoff in Doklam or Doka La that lies to the east of Sikkim, the latest images show massive structures in Doklam, as close as 81 metres to the point of face-off between Indian and Chinese troops. "I don't know who offers such kind of photos. I don't know the detailed information," Chinese Foreign Ministry spokesperson Lu Kang said, according to news agency IANS. Indian soldiers had stopped the Chinese army from constructing a new road in the remote Doklam in mid-June, saying it would give China access to a strategically crucial narrow strip of land or "Chicken's Neck" that links it to its northeastern states. China had retaliated, insisting that it has every right to build roads on its territory, but later the two countries agreed to "disengage" their troops in late August, just ahead of Prime Minister Narendra Modi's visit to China for the high-profile BRICS summit. News reports, however, suggested that China continued to build extensive Chinese infrastructure in the tiny Doklam Plateau. "You must be quite clear. Donglong (Doklam) always belonged to China and is always under China's effective jurisdiction. There is no dispute in this regard," Lu said. He added, "China is exercising its sovereignty in its own territory. It's legitimate and justified. Just as China will not make comments about Indian construction of infrastructure on India's territory, we hope other countries will not make comment on China's construction of infrastructure on its territory." However, the army, which is aware of China's expansion activities in the region post-Doklam standoff, doesn't see this as "serious trouble". The forces are prepared for any exigency, army chief General Bipin Rawat said. "They have carried out some infrastructure development, most of it is temporary in nature. But while their troops may have returned and the infrastructure remains, it is any body's guess whether they would come back there, or it is because of the winter they could not take their equipment away," General Rawat said. In case they come back, we will face them, he added.